Oil and tempera on Masonite. What comes to mind when you think of Grandma Moses? An old-timey folk artist? A phenomenon of 1950s popular culture? Come and take another look at this iconic American artist. Grandma Moses: American Modern has a subversive goal, for it will upset your expectations and get you to see her with fresh eyes. By putting her paintings side-by-side with works by Modernists such as Fernand Léger, Joseph Cornell, Helen Frankenthaler, and Andy Warhol, and folk artists such as Edward Hicks and Joseph Pickett, this exhibition lets you experience how all these artists used color, collage, memory, and their own artistic sensibility to create original masterpieces. 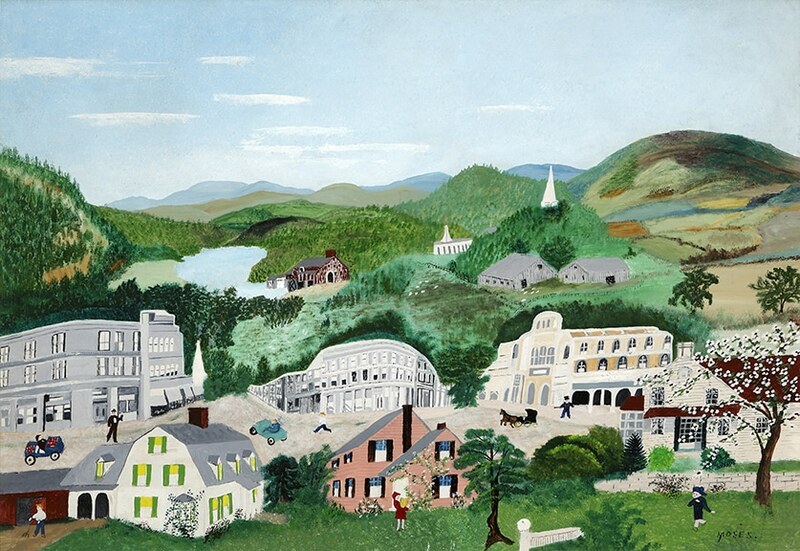 Together with the works in the museum’s permanent Grandma Moses Gallery, the exhibition provides an amazing opportunity to see more than 60 works by this great American artist, the largest group assembled in decades.